If you have a piece of equipment that is creating too much noise, such as HVAC pumps, compressors, generators, or vacuum pumps, an insulated enclosure might be a solution. Sometimes noisy equipment is installed in an area where it would be disruptive such as inside a plant or on the roof of a building. 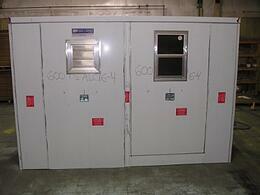 In these or other situations, industrial enclosures can be designed to fit your specific need. As an added perk, the pump insulation would provide protection from the elements that would exist in these situations as well. Here are a few things to keep in mind when considering an enclosure for noise reduction and other protection. The thickness and density of a product together make up the NRC, noise reduction coefficient. Basically, the NRC tells you how much noise will be absorbed by the material. Safe-T-Cover uses 1.5" thick CFAB Cellulose Panels which have a .85 NRC rating, meaning they will absorb 85% of noise passing through them. These panels are made of 65-75% recycled content and in addition to absorbing sound, resist mold growth and have a Class A fire rating. Click here to read more about them and scroll down to the chart to see how much sound is dampened at different panel thicknesses. This insulation is mounted to each panel, as well as the roof panels. Aluminum enclosures with pump insulation can be designed to fit into nearly any situation. Among other features, there are climate control options to make the enclosure suitable for most environments. Heating can be provided for cold climates. Fans, louvers and vents are available for equipment that generates heat. Sometimes, you can even install air conditioning. If the equipment needs to be monitored for power or temperature failure, there are devices available with sound and visual alarms. Some monitoring devices are even able to send an alert online or via cell phone. Another option for enclosures is adding windows. This could be especially helpful for equipment on the plant floor so an interior control panel could be easily viewed. Aluminum enclosures are easily cut and altered for pipe penetrations as well. 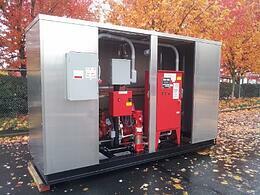 Safe-T-Cover can also design equipment enclosures to be skid mounted or pad mounted if needed. Use this checklist to walk you through your pump cover design. Modular enclosure design allows for easy adaptation. No matter where your noisy equipment is located, there is a customized solution to protect both it and your ears. Your manufacturer should have worked with similar applications in the past and have the ability to produce drawings to address your requirements. Expect rapid turn on pricing and drawings so you don't have to wait or chase them down. Make sure they can deliver the information you need in a day or two. This will help you gauge just how focused their business is on delivering custom solutions. Depending on your project type, a great pump cover vendor will likely even have drawings of standard valve and pump configurations which could simplify your work. Compare stock and custom lead times because you shouldn’t have to wait more than a few weeks to have the ideal enclosure. They should also be able to tell you quickly and accurately how much an industrial enclosure costs. If they build custom enclosures routinely, they’ll have the application experience to quote quickly. Find a manufacturer that you trust to excel in these areas and you will be satisfied with your solution.